Tous les Air Force One à travers le monde. The 1st of 4 Bombardier Global 5000s for the Luftwaffe was delivered to the Air Force on September 22, 2011. Il will be flown by the VIP unit, the FBS BMVg (Ministry of Defence Special Mission Flight) at Koln-Bonn. Prior to this, the aircraft temporary wearing sérial "98+48", had undertaken 2 days of trials with the Luftwaffe trials unit WTD61 at Manching, where it had arrived on September 15. The aircraft had been handed over in Montreal, Canada on August 25 to German Operating Aircraft Leasing GmBH (GOAL), which is acting as a subcontractor to Lufthansa Technik AG, the prime contractor for the acquisition of 4 Global 5000s for the German Federal Ministry of Defence (MoD). It was flown the same day to Hamburg, Germany for hand-over, subsequently flying to its future base at Koln-Bonn on September 4. The aircraft are being worked on at Bombardier's Global Completion Centre in Montreal & the remaining 3 are due to be finished by the end of 2011. The type will be operated by the FBS for the VIP transport & medical evacuation flights. They are replacing the FBS Challenger 601s which are being phased out. A 2nd hand Gulfstream 550 Business Jet has been acquired by the Swedish Air Force as a new VIP transport. The aircraft, "025" is designated Tp-102D in Swedish service & had been painted in a low-visibility colour schéme. It arrived at Stockholm-Bromma airport on June 6 (2011), but was initially temporarily stored until entering service on July 1st. Le célèbre Air Force 1 des USA. 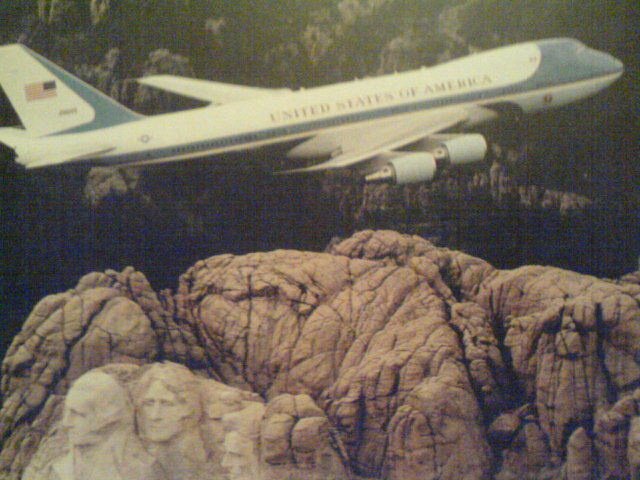 Boeing 747-200 (VC-25A) survolant le Mt Rushmore, qui célèbre les présidents Washington, Jefferson, Roosvelt & Lincoln. The 3 Challenger 604s for 34 Squadron of the Royal Australian Air Force are "A37-001", "A37-002" & "A37-003". Falcon 900 "ST-PSA" has been delivered to the Sudanese Government flight. It is reported to be a gift from Abu Dhabi & joins 1 Falcon 20 & 1 Falcon 50 in the Government Flight. As replacements for the Força Aérea Brasileira's HS-125s (VU-93s), flown by the Grupo de Transporte Espécial (GTE), the FAB is leasing 2 Embraer ERJ-135BJ Legacy 600s designated VC-99Cs. Both were previously with US-based Flight Options LLC &were painted in total FAB colours at Nashville, Tennesee, before delivery. The 1st, "FAB 2580", left Nashville on September 13 to join the GTE, followed by the 2nd, "FAB 2581" on November 9. A new acquisition by the Force Aérienne du Bénin is former Ibéria Boeing 727-256 airliner, which is now serialled "TY-24A". The aircraft has been in storage at Bournemouth-Hurn airport, Dorset, for the last 5 years, but emerged from the hangars on November 15, 2006, carrying its new Bénin serial, albeit otherwise still in basic white scheme & still wearing the Ibéria tail logo. It left Bournemouth later that day for Madrid in Spain. Following the announcement in September 2006 of an order for 4 Agusta Westland AW139 helicos from the Nigerian Government, the 1st of these has now been delivered. The helico, "5N-BJB", passed through Milan-Malpensa airport, Italy, on November 4 at the start of its delivery flight to Nigéria. A formal ceremony was held on May 4, 2011, to hand over a 2nd hand helico Bell 427 that has been donated by Taiwan to Paraguay for the Presidential Helicopter Flight. The helico "N367ND", was officially handed over by the Taiwanese Ambassador in Paraguay, Lien-Sheng Huang, who presented the keys to Paraguayan President, Fernando Lugo. Originally built in 2000, it was delivered new to a Japanese company & was sold in Argentina in 2008. It was, however, allocated a US civil registration & operated in Argentina in US marks for the next 2 years. The helico had been offered to Paraguay last November by its owners, Helicopters Modena SA, but due to its high cost, the acquisition was put on hold until Taiwan offered to purchase it & donate it to President Lugo. The US civil registration was finally cancelled on May 17, 2011, as exported to Argentina, although by then it had already been purchased by the Taiwanese Government & given to Paraguay. It is now flying with military serial "H-0401" & will be operated as a dedicated Presidential helico by the Fuerza Aerea Paraguaya & based at Campo Grande/Nu-Guazu AB, alongside Asuncion-Silvio Petrossi international airport. Boeing 737-7FG "HZ-MF1" du royaume d'Arabie Saoudite. Boeing 737-33A "B-4018" appartenant au gouvernement Chinois. Airbus A319-112 CJ "2949", avion "personnel" de la famille Royale de Malaisie. A report on the agenda of a Hungarian Cabinet meeting on February 11, 2011, proposed 3 alternative options for the acquisition of a new gouvernment VIP transport aircraft. The report indicates that such an aircraft would considerably assist in meeting Hungary's increasing international commitments & state protocol duties. The 1st of the 3 options suggested was use of a Bombardier CRJ200 aircraft that had been retired from the fleet of national flag carrier Malev. This would, however, have to be overhauled at an estimated cost of 1,2 million of US dollars. The 2nd option is for state leaders to lease private aircraft as required for specific missions. The report estimates that this would cost over 6000 dollars per hour. The 3rd option proposed was outright purchase of a Dassault Falcon 900 at a cost of 505 million dollars. The cabinet has asked to Development Ministry to examine the costs of official state aircraft flights before any further decisions are made. 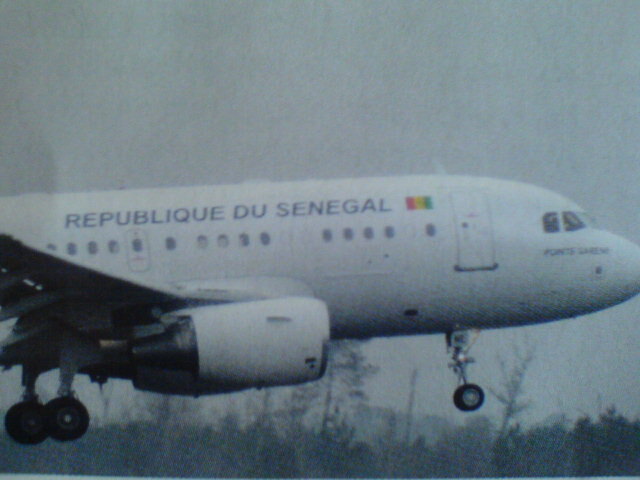 Airbus A319-115X "6V-ANE" de la république du Sénégal. Dassault Falcon 7X "5N-FGU" de l'armée de l'air du Nigéria. Garuda Indonesia was handed over 2 former Boeing 737-400 to the Tentara Nasional Indonesia - Angkatan Udara (TNI-AU) on March 9, 2011, at Halim-Perdanakusuna airport. The aircraft will be retained in standard passenger configuration, without modification, & operated by the TNI-AU's VIP unit, Skadron Udara 17, which is based at Halim. Transfer of the aircraft after retirement from Garuda service had been agreed between the airline & the TNI-AU late last year. 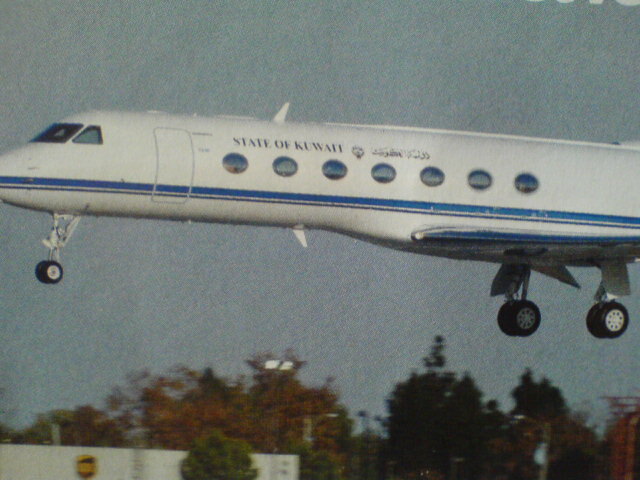 Gulfstream G550 "9K-GFA" du Koweit. Presidential aircraft are to de acquired by the Federal Government of Nigeria, according to the 2010 Appropriations Bill. The Bill was sent to the National Assembly for consideration on November 24, 2009, by President Umaru Musa Yar'Adua. Funding of some 210 million of US dollars for the aircraft was included under the 'Intelligence Community' budget section of the Bill. No details were given of the types of aircraft to be acquired. - Cessna 550 Citation II. An Antonov An-74TK-300 that was ordered by the Laos Government under a contract signed in 2005 has now been delivered. The aircraft, "RDPL-34020", was handed over at the Kharkiv Aviation Plant on October 15, 2009. It joins an Antonov An-74TK-100 that was delivered to Laos in 1998. C-9C (DC-9) "73-1682" de l'USAF. Hélico AW139 "SIX-051" du VIP Squadron du Pakistan & son équipage. Boeing 747-47C "20-1101", transport de la famille impériale du Japon. Airbus A319-115CJ "UR-ABA" de la République d'Ukraine. Former German Air Force Challenger 601 "12+03" has been sold to the Gambian Government. 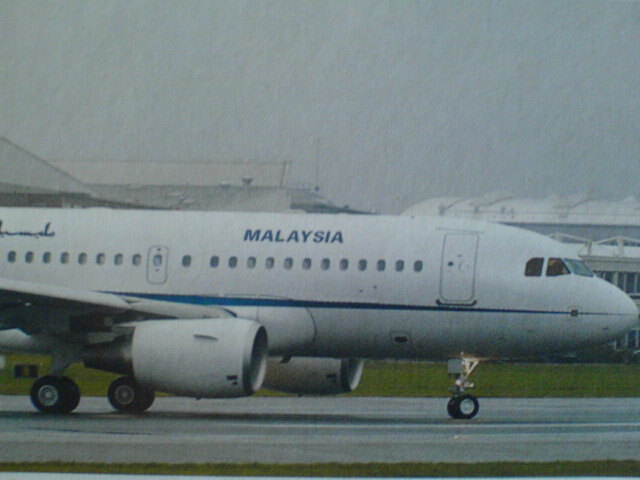 As the end of November 2010, the aircraft was still at its former base at Koln-Bonn being prepared for its delivery. The aircraft is 1 of 2 that had been offered for sale last year by the German Defense Ministry. Tupolev Tu-154M "B-4017" du gouvernement de la Chine Populaire. Xian Aircraft Corporation (XAC) signed an agreement on November 16, 2010, with the Laos Government for 2 XAC MA600 Twin-Turboprop transport aircraft. They will operate alongside 2 Antonov An-74s already operated by the Laos Government & Air Force's VIP Squadron based at Vientaine-Wattay AB. Yakuza, je ne parle pas Arabe... Peux-tu me traduire l'inscription sur l'avion, stp? Sujet: Re: Tous les Air Force One à travers le monde.